Daylength, or photoperiod, affects the onset of reproductive development in many land plants, and the mechanism of this regulation is thought to involve an internal biological clock. 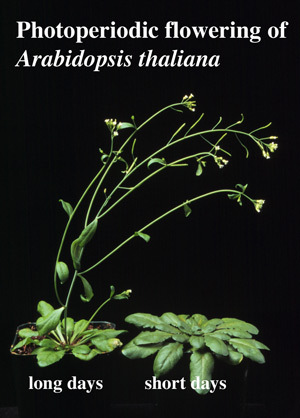 We are using genetic approaches to further elucidate the mechanism of photoperiodic flowering in Arabidopsis thaliana, a model plant that is a member of the mustard family, including the isolation and characterization of mutants that are altered in photoperiodic regulation of flowering, and the mapping and positional cloning of new genes identified by mutation. 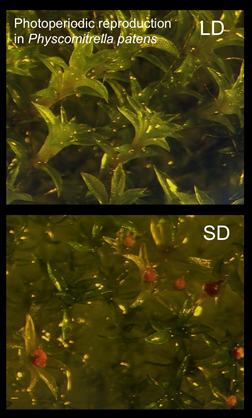 We are using functional genomic approaches to address the evolutionary origin and conservation of photoperiodism in land plants, focusing on the involvement of key genes identified in flowering plants in the photoperiodic regulation of sexual reproduction in the moss Physcomitrella patens. Genetics and Development of Organisms (BIOL 114) - one of three core introductory Biology courses. Genetics and Development of Organisms: This course introduces the mechanisms of heredity, the expression of genetic information, and the means by which genes encode developmental programs. Genetics and development are part of a continuous process, and the genetic mechanisms and developmental patterns of living organisms reveal a fundamental kinship of life on earth. Genetics and molecular biology as tools for the study of biological problems will be introduced, as will current topics in biotechnology. Plant Biology and Laboratory Experience in Plant Biology (BIOL 233 and 234) - intermediate level courses that deal with the form, function, and diversity of plants. Plant Biology: This course presents an introductory examination of plant function and structure. Physiology, morphology, reproduction, and development will be considered, with an emphasis on flowering plants. Comparative life cycles and structures of different divisions of plants and algae will also be discussed, as will problems with plant classification schemes. Emphasis will be placed upon current topics in plant biology, particularly as they relate to important scientific questions and practical outcomes. Laboratory Experience in Plant Biology: Topics include the cell, tissue, and organ structure of vascular seed plants, and experimental and field investigation of selected plant processes such as flowering and hormonal interactions in growth and development. Experimental genetic analysis: This laboratory course introduces both genetic concepts and genetic approaches commonly used to understand biological processes. We will cover fundamental techniques including mutant screens, double mutant analysis, linkage mapping, and map-based cloning of genetic loci. We will use the model plant Arabidopsis thaliana as our experimental organism, although the approaches taken in this course can be used in any organism amenable to genetic analysis. Developmental Biology and Experiments in Developmental Biology (BIOL 321 and 322) - advanced level courses that deal with the mechanism of development of animals and plants. Developmental Biology: This course concerns the mechanisms responsible for building multicellular organisms. The processes of fertilization, embryogenesis, post-embryonic development, and aging will be examined at the molecular and cellular levels. Particular attention will be devoted to the experimental basis for current models of these processes. Students will read original research literature as well as standard texts. Experiments in Developmental Biology: This laboratory course introduces students to modern approaches for discovering developmental mechanisms, using model systems such as Drosophila, Xenopus, C. elegans, zebrafish, and Arabidopsis. Students document major cellular and developmental events in embryogenesis of these organisms, and conduct experiments to investigate the cellular, molecular, and genetic bases of morphogenesis, pattern development, and developmental determination. Information and Communication: Our aim in this course will be to explore the fundamental principles of information and communication, integrating ideas from the entire range of biological systems. We will consider a broad range of organisms, including prokaryotes, fungi, plants, and animals. This senior-level seminar class will rely heavily on the primary literature, and students will orally present and critique relevant papers. A synthetic paper (12-15 pages) will be the major course assignment, and some class time will be devoted to "workshop" sessions where students will provide peer review on each other’s work. Lina joined the lab in the Fall of 2004 as a research assistant before beginning her project to identify extragenic enhancers of elf3-7 using insertional mutagenesis in the context of Research in Biology. Emily joined the lab in Fall 2005 as a student in Research in Biology to design a microarray-based approach with the goal of identifying additional genes involved in photoperiodic flowering. Amy joined the lab in Fall 2003 as a student in Research Strategies and pursued an activation tagging approach to identify new genes involved in the photoperiodic regulation of flowering. She continued this project as a Summer Science Scholar and an Honors research student, receiving High Honors for her work. After working at the University of Pittsburgh in a research lab for a few years, Amy is pursuing a masters in genetic counseling. 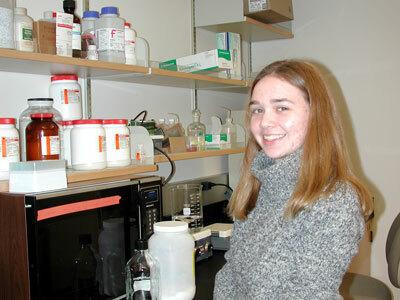 Sam joined the lab in Fall 2003 as a student in Research Strategies. He worked to characterize and map the pse2 mutation as a Summer Science Scholar and an Honors research student, receiving High Honors for his work. He is currently a member of the Peace Corps in St. Lucia. 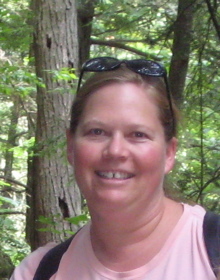 Bethany joined the lab in Spring 2004 as a student in Research Strategies and worked to apply splinkerette technology for the identification of insertion site locations, before moving on to work on the mapping of PSE7. She is currently working in a research lab at Children's Hospital in Boston. Adam joined the lab in Spring 2002 as a student in Research Strategies. 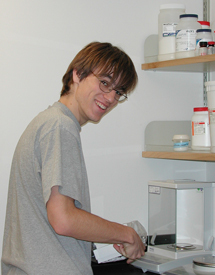 He was awarded a Summer Undergraduate Research Fellowship from the American Society of Plant Biologists to support his work on the isolation of new genes involved in photoperiodic regulation by activation tagging during summer of 2002. Adam continued this project as an Honors research student, and received Highest Honors for his work. 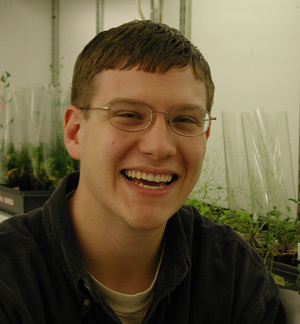 After presenting his work at Plant Biology 2003 in Honolulu and taking a brief vacation, Adam rejoined the lab as a full-time research assistant in August 2003, and is currently pursuing a PhD at the University of Michigan. 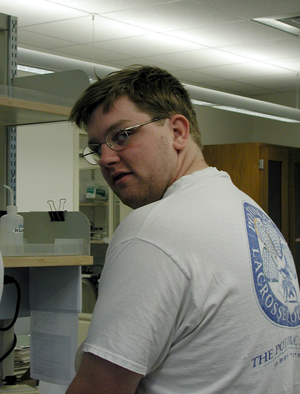 Matt was a member of the lab from Spring 2001 through Spring 2003 as a research assistant, as a student in Research Strategies, and as part of the Kenyon Summer Science Scholar program. Matt started the PSE1mapping project (followed up by Andrew Farrell, below) and mapped PSE13 to the top of chromosome IV. He presented his work at the 14th International Conference on Arabidopsis Research in Madison, Wisconsin. Adfter graduation he worked as a research technician in Steve Johnson's lab at Washington University in St. Louis before beginning medical school. Doobie joined the lab in Spring 2002 as a student in Research Strategies, spent the summer of 2002 at Kenyon as part of the Kenyon Summer Science Scholar program, and continued his research during the 2002-2003 academic year as a student in Research Strategies. Doobie mapped PSE1 to the middle of chromosome IV and presented his work at the 14th International Conference on Arabidopsis Research in Madison, Wisconsin. He is currently working at GeneDX, a genetic testing and diagnosis company in the Washington, DC area. 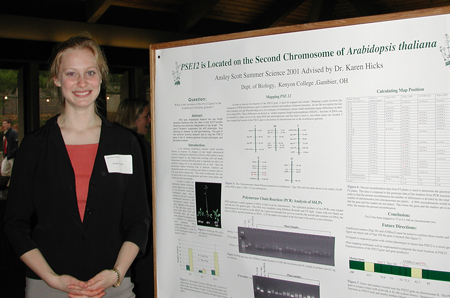 Kathy joined the lab in Fall 2002 as a student in Research Strategies and spent the summer of 2003 at Kenyon as part of the Kenyon Summer Science Scholar program working on the characterization and mapping of a number of pse mutations. Kathy continued this project as an Honors research student, and received High Honors for her work. 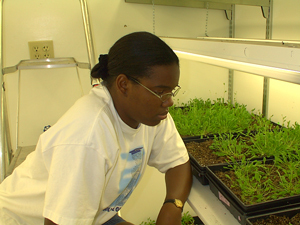 After presenting her work at the 15th International Conference on Arabidopsis Research in Berlin, Germany, Kathy moved to the DC area to take a position in a laboratory at the National Institutes of Health in August 2004. She is currently in vet school. 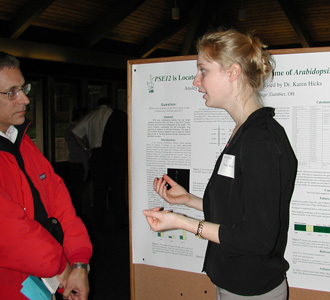 Ansley was a Summer Science Scholar in 2001, and presented a poster about her research on mapping PSE12 at the Summer Science Scholar Poster Session in October of 2001. Ansley continued this project as an Honors research student, and received Highest Honors for her work. She recenlty completed her Ph.D. in Molecular, Cellular, and Developmental Biology at UC Berkeley. 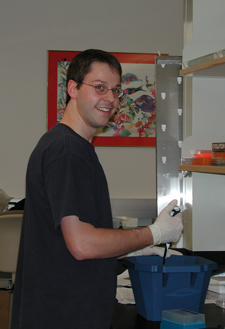 Brad was a Research Strategies student Fall 2001, carrying out complementation tests between the pse mutants. He is currently a graduate student at Washington University in St. Louis. Lydia was a research assistant 1999-2001, and was a Summer Science Scholar in 2000 and 2001. Erica was a Summer Science Scholar in 2000. 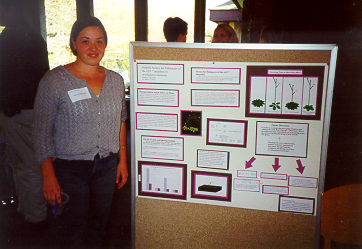 She presented a poster about her research on mapping suppressor mutations at the Summer Science Scholar Poster Session in October of 2000. Adrienne was a research assistant in 1999-2000, and was a Summer Science Scholar in 2000. 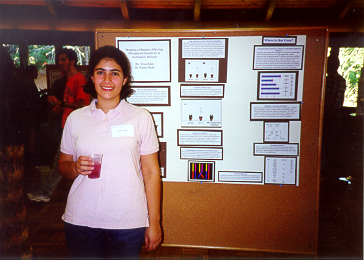 She presented a poster about her research on identifying elf3-7 enhancer mutations at the Summer Science Scholar Poster Session in October of 2000. Rensing, S.A. et al. 2008. The Physcomitrella genome reveals evolutionary insights into the conquest of land by plants. Science 319:64-69. Kim, W.-Y., Hicks, K.A., and Somers, D.E. 2005. Independent roles for EARLY FLOWERING 3 and ZEITLUPE in the control of circadian timing, hypocotyl length and flowering time.Plant Physiology 139:1557-1569. Hicks, K.A., Albertson, T.M., and Wagner, D.R. 2001. EARLY FLOWERING 3 encodes a novel protein that regulates circadian clock function and flowering in Arabidopsis. Plant Cell 13:1281-1292. Hicks, K.A., Millar, A.J., Carré, I.A., Somers, D.E., Straume, M., Meeks-Wagner, D.R., and Kay, S.A. 1996. Conditional circadian dysfunction of the Arabidopsis early-flowering 3 mutant. Science 274:790-792. Zagotta, M.T., Hicks, K.A., Jacobs, C.I., Young, J.C., Hangarter, R.P., and Meeks-Wagner, D.R. 1996. The ArabidopsisELF3 gene regulates vegetative photomorphogenesis and the photoperiodic induction of flowering. Plant J. 10:691-702. Hicks, K.A., Sundås, A., and Meeks-Wagner, D.R. 1996. Arabidopsis early-flowering mutants reveal multiple levels of regulation in the vegetative-to-floral transition. Sem. Cell Dev. Biol. 7:409-418. Hicks, K.A. and Grossman, A.D. 1996. Altering the level and regulation of the major sigma subunit of RNA polymerase affects gene expression and development in Bacillus subtilis. Mol. Microbiol. 20: 201-212. Hicks, K.A. and Grossman, A.D. 1995. Characterization of csh203::Tn917lac, a mutation in Bacillus subtilis that makes the sporulation sigma factor sigma-H essential for normal vegetative growth. J. Bacteriol. 177: 3736-3742. Hicks, K.A. 1993. Altering the level and regulation of the sigma-A subunit of Bacillus subtilis RNA polymerase affects gene expression and development. Ph.D. thesis. Pelosi, E., Hicks, K.A., Sacks, S.L., and Coen, D.M. 1992. Heterogeneity of a herpes simplex virus clinical isolate exhibiting resistance to acyclovir and foscarnet. In Innovations in antiviral development and the detection of virus infections, T. M. Block, R. L. Crowel, D. L. Jungkind, and L. Walsh, eds. (Plenum Press, New York), pp. 151-158. Grossman, A.D., Ireton, K., Hoff, E.F., LeDeaux, J.R., Rudner, D.Z., Magnuson R., and Hicks, K.A. 1991. Signal transduction and the initiation of sporulation in Bacillus subtilis. Semin. Dev. Biol. 2:31-36. Hicks, K., Friedman, B., and Rosner, M.R. 1989. Basic fibroblast-like growth factor is present in the conditioned medium of simian sarcoma virus transformed NRK cells. Biochem. Biophys. Res. Comm. 164:1323-1330. Hicks, K., Friedman, B., and Rosner, M.R. 1989. Basic and acidic fibroblast growth factors modulate the epidermal growth factor receptor by a protein kinase C-independent pathway. Biochem. Biophys. Res. Comm. 164: 796-803. Leib, D.A., Bogard, C.L., Kosc-Vnenchak, M., Hicks, K.A., Coen, D.M., Knipe, D.M., and Schaffer, P.A. 1989. A deletion mutant of the latency-associated transcript of herpes simplex virus type 1 reactivates from the latent state with reduced frequency. J. Virol. 63:2893-2900. Leib, D.A., Coen, D.M., Bogard, C.L., Hicks, K.A., Yager, D.R., Knipe, D.M., Tyler, K.L., and Schaffer, P.A. 1989. Immediate-early regulatory gene mutants define different stages in the establishment and reactivation of herpes simplex virus latency. J. Virol. 63:759-768. Sacks, S.L., Wanklin, R.J., Reece, D.E., Hicks, K.A., Tyler, K.L., and Coen, D.M. 1989. Progressive esophagitis from acyclovir-resistant herpes simplex. Clinical roles for DNA Polymerase mutants and viral heterogeneity? Ann. Intern. Med. 111:893-899. The Biology and Gender Study Group: A. Beldecos, S. Bailey, S. Gilbert, K. Hicks, L. Kenschaft, N. Niemczyk, R. Rosenberg, S. Schaertel, and A. Wedel. 1989. The Importance of Feminist Critique for Contemporary Cell Biology. In Feminism & Science, N. Tuana, ed. (Indiana University Press, Bloomington and Indianapolis), pp. 172-187. Karen A. Hicks Kenyon College Biology Department Gambier, Ohio 43022 (740)427-5379 20-Mar-2006 Comments?